The air in the deserted streets carries no hint of moisture. Life exists solely in the form of isolated stunted shrubs eking out a living; testing the limits of survival. The only sound is the wind patiently working a pane of glass loose from its frame. The fine desert sands are blown through the town, working their way into the abandoned houses. Welcome to Kolmanskop. In 1908, Zacherias Lewala, a railway employee shoveling drift sand from the tracks, found some interesting stones. He took them to August Stauch, the permanent-way inspector of the line, who was an avid naturalist, and had asked his workers to bring in any unusual objects they found. Mr Stauch, a former employee of De Beers in South Africa, took the stones to Luderitz for an expert opinion. The stones were diamonds. When the rumors of the discovery, in what was then known as German South-West Africa, reached Cape Town, they were received with incredulity. This inhospitable and desolate region had been offered to the Cape government in 1885 but politely refused. The richest diamond deposits in the world were to be found in this area. All the available ground in the vicinity of Luderitz was quickly pegged out and claimed. Laborers, organised in search lines and muffled against the blowing sands, crawled along on all fours armed with jam jars. The diamonds were picked off the ground and the jars filled rapidly. One of the first discoveries was made just before nightfall, so prospecting continued long into the night, with the glimmer of stones identifiable by moonlight. Kolmanskop grew out of the diamond boom. The region was administered by Germany at the beginning of the century and the town reflected this in its character. It was said of the Germans that only after they had finished building the pub and the skittle alley, their favorite form of relaxation, did they start looking for suitable plots to build their houses. In 1912, the area produced one million carats or 11.7 per cent of the world’s total diamond production. Such wealth meant that despite the harsh climate and isolation, the miners could afford every possible European luxury. The town had a local butcher, baker and post office. An ice plant was established to make blocks to use in food coolers as well as to manufacture the town’s own delicious lemonade. Elaborate houses were built to accommodate the town’s architect, teacher, doctors and mining managers. A large hospital employed two German doctors, one of whom was understandably popular for prescribing his patients an evening tonic of caviar sandwiches and champagne. The inhabitants did not lack for entertainment either. A German expert was brought in to design and supervise the building of a magnificent hall, with acoustics so fine that today visitors are still encouraged to put them to the test and burst into song. The mine even paid for opera companies to be shipped from Europe to perform in this oasis. The hall was also used by the local orchestra, theatre group and gymnastics troop. In its heyday, the town looked very different. Fresh water was bought in by rail from 120km away and pumped into storage tanks. The water nurtured lush gardens with manicured lawns, rose beds and eucalyptus trees. Pets were difficult to keep in the conditions, but one family had a pet ostrich that terrorised the townspeople. It was only partly able to redeem itself at Christmas by pulling a sled containing Father Christmas over the sand. World War I interrupted mining operations. The resumption of mining after the war led to the slow depletion of deposits. By the early-’30s, the area was in decline. Hastening the town’s demise was the discovery in 1928 of the richest diamond-bearing deposits ever known. These were on the beach terraces 270km south of Kolmanskop, near the Orange River. Many of the town’s inhabitants joined the rush to the south, leaving their homes and possessions behind. 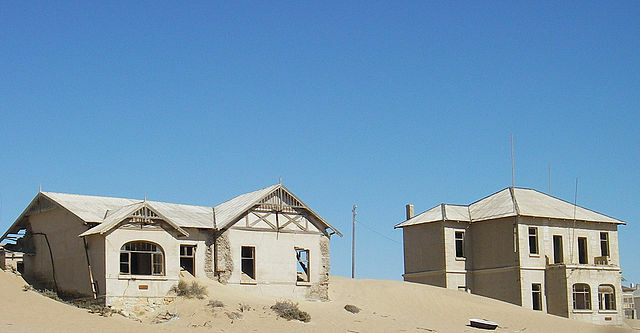 Kolmanskop retained some importance as a supply depot for other mining operations, including those on the Orange River. This role passed, too, as it became easier to bring supplies from South Africa. The last three families finally deserted the town in 1956. The sands that were once swept up every morning now gather unhindered. The desert encroaches into the buildings, gradually filling the empty rooms with smooth rolling drifts. The houses still stand but it is the elements that are in control. The roofs are gradually being laid bare and the glass worked from the ornate frames. Only fragments of the inhabitants’ lives remain, a battered kettle in a beautifully tiled kitchen, a warped wardrobe resting wearily on its side, some painstakingly hand-painted wall designs, a bathtub breasting a growing dune like a boat at sea. The desert is coming to relentlessly reclaim its territory under an ever thickening fold of sand. Yet not even a century ago, people laughed, loved and dreamt in this town, creating an extraordinary place in an unwelcoming land.